St. Mark’s Preschool 2s and 3s Class meets two days a week for 2 hours. It is a great introductory class for young children. The student to teacher ratio in this class is 3-5 students per teacher. The main focus of this class is to teach children how to get along well with others in a classroom setting. We use curriculum from Second Step Early Learning as well as other supplemental preschool learning materials. 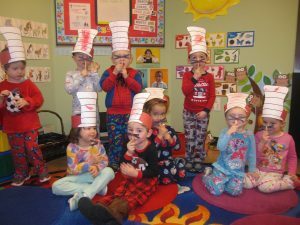 Children are introduced to colors and shapes and a variety of themes related to the time of year. We use variety of dramatic play and building toys, as well as sensory objects. We sing songs, offer opportunities to do art, and engage in gross motor play daily. We also do occasional baking projects and get kids thinking about science as often as possible. We take 2-3 field trips a year to enhance our curriculum.